A super satisfying after dinner-treat free of processed sweetener. 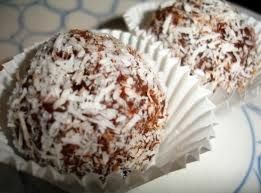 Protein and nutrient dense, these “truffles” are a perfect alternative to sugar-laden desserts and chocolates. Scoops of green booster food adds an additional nutritious punch! Place sunflower seeds and almonds in the bowl of a food processor and pulse until the texture is very coarse. Turn machine off, scrape bottom and sides of bowl well. Add dates and pulse until texture is sandy and consistent. Without the blade running, add coconut butter, green powder, cacao and salt. Pulse until combined. Scrape bottom and sides of bowl well. With blade running, add water, one tablespoon at a time, until mixture begins pulling together. Turn blade off and test the stickiness with your fingers. Once the mixture will adhere together easily from the pressure of your fingers, stop adding water. Spread coconut flakes across a large, flat plate. Using a small melon baller or spoon, roll small truffle-size balls of the cocoa mixture gently between your palms. Roll each ball in the flaked coconut until evenly coated. Repeat with remaining truffle mixture. Refrigerate truffles at least two hours before serving. Store in fridge for two to three weeks. Placing the truffles in small baking cups makes for easy storage and serving. Want something a little spicier? Add a pinch of cayenne or chipotle chile powder to the mixture with the powdered cacao. Then roll the truffles in a mix of chile powder and coconut.